"The morning cup of coffee has an exhilaration about it which the cheering influence of the afternoon or evening cup of tea cannot be expected to reproduce." ~Wendell Holmes Sr. 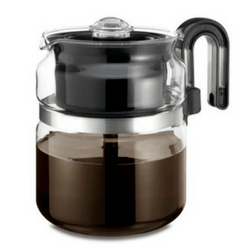 In this round-up article, you will be introduced to 10 12 of the best stovetop coffee percolators. Here, you will find options for different designs, features, and functionalities. Which in turn, should help you decide which one is right for you! 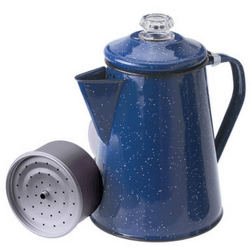 The GSI Outdoors Enamelware Percolator is a well made pot with an excellent fit and finish. Moreover, the painting on it is high quality. It features a strong handle with a lid attached, so that the lid doesn’t fall off during usage. You can choose from two colors, red and blue. Depending on the color of the area you intend to keep it in, either of the two colors should fit in well with the surrounding paint. The pot makes rich, dark, and flavorful coffee that can be compared to that which is made by high dollar coffee makers. If you are looking for an inexpensive coffee percolator with excellent fit and finish, this is it. Although the Chinook Timberline Coffee Percolator may not be the lightest in weight, it makes up for its shortcoming in durability. Unlike it's cousin, the Chinook Canyon version, this model is not prone to denting. The reason why people like percolators more than drip coffee makers is because it allows them to adjust the perk time to get exactly the brew strength of their liking. The Chinook Timberline is made to last for years, effectively eliminating the need to buy additional or replacement pots after a brief period of usage. Cleaning and maintenance of this unit is also simple and you don’t necessarily need a paper filter to get the best taste. The lid is also attached to the pot so that it doesn’t drop into your coffee and ruin your experience. 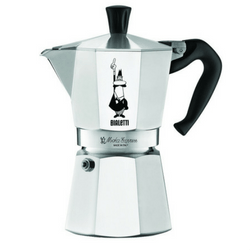 The Bialetti Stovetop Espresso Maker is capable of producing rich espresso in minutes. Also, the Bialetti is designed to diffuse heat, perfectly leading to an improved coffee aroma, thanks to the aluminum eight-side design in less than 5 minutes; you can have very rich cups of joe. Not only is it easy to disassemble, but it is also easy to clean. This espresso maker is designed in Italy, a country known for producing excellent espresso machines and dedication to the coffee culture. Furthermore, it's backed by a 2 year warranty so that you can easily get a replacement in the event of a factory defect. If you are looking for a simple, yet power coffee pot to make coffee like the Italians, this is it. Percolated brew is often robust tasting in a way that drip coffee is not. 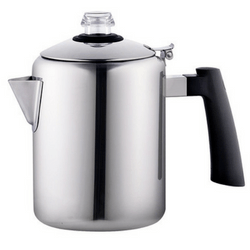 If you are interested in experiencing the rich and velvety taste of perked brew, consider this Farberware Percolator. This coffee percolator is well designed in an attractive shape and will definitely improve the aesthetics of your kitchen. The Farberware Yosemite is made from stainless steel which makes it sturdy and hefty. Even though it is heavy duty, cleaning it should be easy and stress free. It can prepare 8 cups of coffee, thanks to the large reservoir. The interior rod and basket are well made and they fit easily in the lock-down lid. 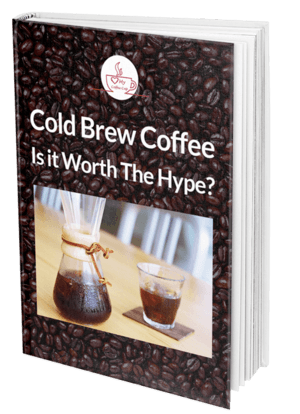 Are you looking for a consistent coffee taste? Tops 55705 Rapid Brew Stainless Steel Coffee Percolator will not disappoint. 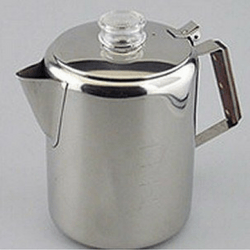 This coffee percolator is not only capable of making a rich tasting fresh cup of java, but also brings a clear, non-biter tasting coffee. Even though the Rapid Brew is compact, it has the capacity to make a great cup of joe. Not only is it sturdy, but also well made, increasing the likelihood that you will use if for a long time to come. 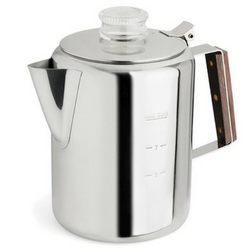 The 6 Cup Moka Latte Percolator Pot is the favorite of many coffee lovers. At first use, it can produce coffee that is bitter free, smooth, and fresh - which beats a few French Press coffee makers (maybe). Also, you won’t have to wipe out a huge chunk of your savings buying this machine. 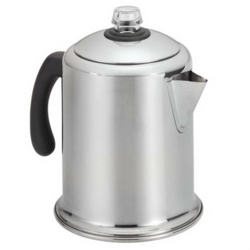 The affordable Moka Percolator has a classic style, with the body made of stainless steel, making it durable and easy to clean. With the right care, this percolate coffee maker should last you for years. For those looking for a product that can perform a number of tasks, then this is the real deal. Whether you are looking to boil water, make coffee or brew tea, this percolator will do it all for you. The Cook N Home Stovetop Percolator is manufactured out of polished stainless steel, and this gives it an attractive shine that lifts your mood even more than the brew that comes from inside it does. The choice of stainless steel here is also instructive because the material allows your coffee or tea to heat quickly and stay that way. While the product retains a lot of heat, you don’t have to worry about getting your fingers singed because the handle is always cool and comfortable to the touch. Moreover, this percolator is tailored to a whole lot of culinary needs, allowing you to serve a decent crowd of 8 at the same time. If you are looking for a coffee maker that will help you fine-tune your brewing process for the absolute best taste and rich flavor, this coffee kettle will not disappoint you. The Coffee Gator can control the temperature of the water when you are boiling it so that it is not too cold and not too hot. With the perfect temperature for your coffee, you can easily eliminate the guess work and brew the coffee to your favorite taste. 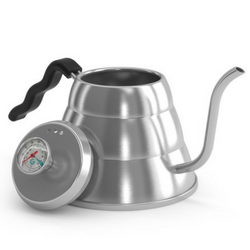 This Coffee Gator Kettle comes in a goose-neck design to provide you with the best pour over coffee. When it is time to pour, you will discover a smooth and precise flow to the water, which helps in the overall quality of your coffee. Although this kettle is not that cheap, the quality of the build will help you enjoy many years of service from this model. 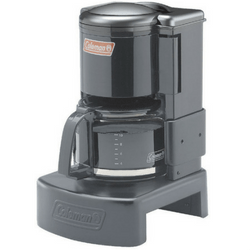 The Coleman Camping Coffee Maker is designed in such a way that a smart kid can use it. When you are using this on your burner, don’t make the flame too high because that might melt the plastic part of this coffee maker. Other than that, this is a great coffee maker to take with you on weekend camping trips. The beauty of the Coleman is that it provides consistent quality and flavor. 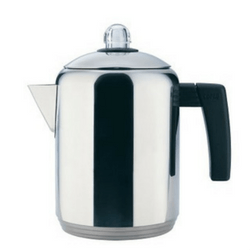 The Copco Stovetop Percolator is a well made item. Although it comes with plastic parts, they really hold up well and don’t detract from the machine. The Copco percolator allows you to control the amount of time you let the coffee percolate, thus, resulting in a strong, wonderful taste. Although it only provides up to 8 cups at a time, it will eliminate the need for you to use an electric percolator – a benefit that is hard to pass over. It has a comfortable handle for quick and easy pouring, and is finished in a beautiful durable polished stainless steel. 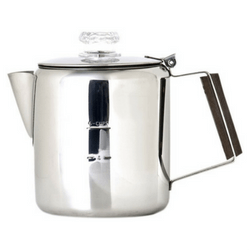 If you are looking for a high quality percolator that stands the test of time, then you will be right at home with the best Mendelco can offer. Also, this 8 Cup Glass Stovetop Percolator is made from Borosilicate Glass, which makes it hardy, attractive to look at and resistant to a whole lot of elements. If the term 'German Efficiency' was ever to be correctly used, it would be in describing this stove top percolator. It is ideal whether you are whipping up a quick brew for yourself or preparing a nice cup for everyone at the table on a Sunday afternoon. If you were worried about stains, then worry no more because this percolator stands tall against all types of stains. It is also dishwasher friendly so can be cleaned alongside any other household items. Finally, while the product is essentially German, it is assembled in the USA and is compliant with American standards. Although this Rapid Brew Coffee Percolator is not very cool when you look at it in the sense of design, the coffee it makes is great, and that is what matters. However, this stovetop percolator is different from other versions that are constructed with killer looks and concentrates on the job at hand - making great perked coffee. 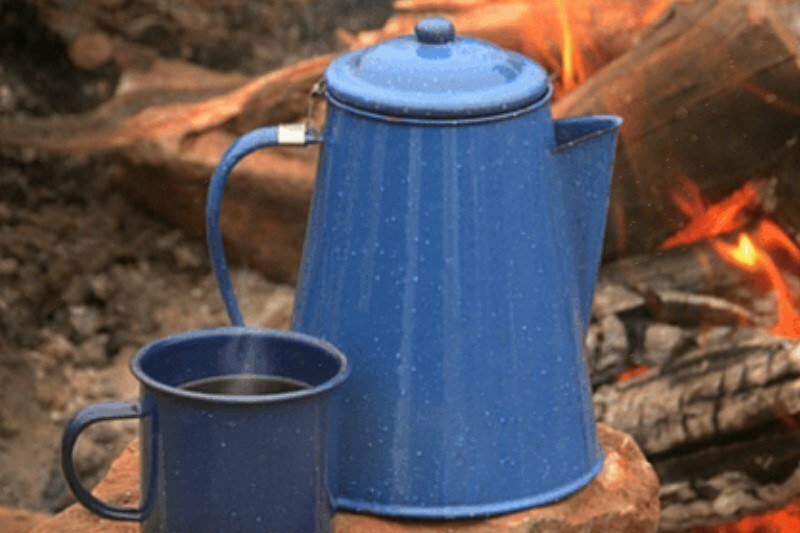 This Rapid Brew Percolator has a glass knob, permawood handle, and is non-electric; which makes a great choice for camping. The best coffee percolator is that which fits in nicely with your budget and suits your lifestyle. In this round-up, we have combined percolators with different styles, design, and functionality to give you a wide array of options to choose from when selecting your next stove-top percolator. 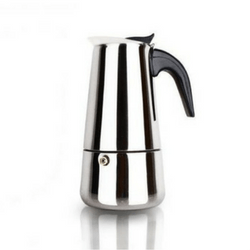 Have you tried any of these stovetop coffee percolators? Let us know in the comments below!